Hello all, why yes, I do still participate in this link-up, why do you ask? One week of school under the belt and exactly 0 crazy parent emails or behavior problems...so far. If you're a teacher you understand how truly miraculous that is! Last Monday was "Meet the Teacher" and tonight is "Parent Night" so I'm writing this in the brief half hour before I have to go back up to school. Also, since we haven't eaten at home, oh in about 2 weeks, unless you count frozen pizza, my participation probably counts as cheating...even in a link-up with no rules. After church last night, we went to one of our favorite restaurants downtown. They're known for their cocktails, and are even accommodating to the expectant. They made me a lovely concoction of blackberries, ginger beer, with a hint of jalapeño. It was delish. Since it was Houston's Restaurant Week (which is really restaurant month) we even got dessert, and as luck would have it, the dessert called "Sticky Toffee" came garnished with berries. I had already started to dig in when Mark reminded me that technically, this could count for MIM. The berries, while not the star, were the perfect garnish to the rich toffee sauce. Also, I watched an episode of Rachel Ray where she made a salad with strawberries, balsamic and spinach, so that counts too, right? I guess we liked it. Be sure and head over to Tasha who's hosting, and Jessica who's back from vacation, and I get to announce this week's ingredient. In honor of being almost 20 weeks in the family way, I hereby choose, PICKLES. 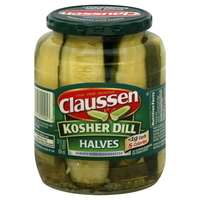 I prefer Claussen's; they hang in the refrigerator section, not in the pickle aisle. But who says you can't pickle some onions, or whatever. Also, don't some you have like gardens and stuff? What else will you be doing with those cucumbers? Nothing compares to Claussen pickles! So yummy! !